We have all felt the blowing of wind. Sometimes it is fast and sometimes gentle. Can you definitely assert that the speed of wind at a particular instant of time is more or less then at a different time? An anemometer is a device that can help you measure the speed of wind. You too can build is a model of an anemometer to measure the speed of wind yourself.. A real one will be able to accurately measure how fast the wind is blowing. Yours will give you only approximation of how fast it's blowing. It can't give you an exact wind speed. The energy in the moving wind can be used to generate electricity. But you have to know how fast the wind is blowing before you can harness wind power. 1. If you are using paper cups, cut off their rolled edges to make them lighter. If you are using disposable bottles, cut off equal small cuplike sections from each one of them. 2. Color the outside of one cup/tumbler/bottle section with the marking pen. 3. Cut out two cardboard strips, Cross these strips so they make a plus (+) sign. Staple them together. 4. Take the ruler and pencil and draw lines from the outside corners of where the cardboard strips come together to the opposite corners. 5. Where the pencil lines cross will be the exact middle of the cross. Staple the cups to the ends of the cardboard strips. Make sure the cups all face the same direction. 6. Push the pin through the center of the cardboard (where the pencil lines cross) and attach the cardboard cross with the cups on it to the eraser point of the pencil. 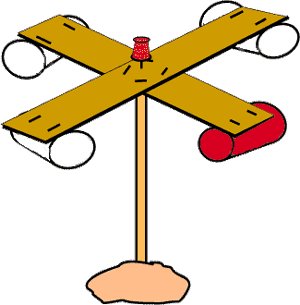 Test your anemometer in front of a table fan or else blow on the cups to make sure the cardboard spins around freely on the pin. You cannot measure the wind speed with this anemometer, but it can give you an idea of how fast the wind is blowing. Using your watch, count the number of times the colored cup spins around in one minute. You are measuring the wind speed in revolutions (turns) per minute. Alternatively, you can fix a thread to one of the strips in such a way that when it turns it winds on the pencil. Weather forecasters' anemometers convert the revolutions per minute into kilometers per hour. Keep a record of the wind speeds you're measuring for the next few days.